You can take the whole facial animation thing a step further with London Spengler’s Pandora FACE 2.0, which basically allows you to play two SL facial expressions at the same time, making for all sorts of possible combinations. While working on editing my shape, I recalled talking with an SL photographer about a year ago on the subject of getting more facial expressions beyond the ones already built into SL. Perhaps editing my face shape seemed like an obvious answer to me because I work with shapes a lot for my store, but it was something that had not occurred to him to try. While I was working on my shape edits, I was conversing with Gogo. 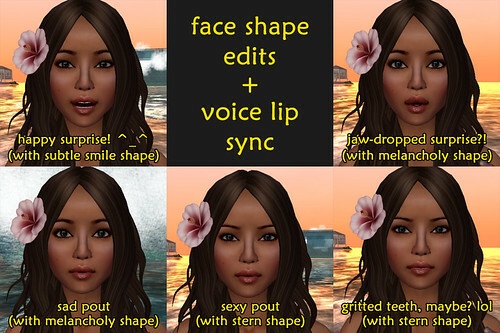 I asked her, “If you could order up new facial animations from Linden Lab, what would you ask for?” A couple of the things that ended up on our list of emotes we’d like to see were a slight parting of the lips, and a pout. I learned from our discussion that one way to accomplish the slight parting of lips effect is to enable Slow Motion animations in the Advanced menu, then hit the smile emote and try to catch your avatar in a snapshot right as the animation starts. 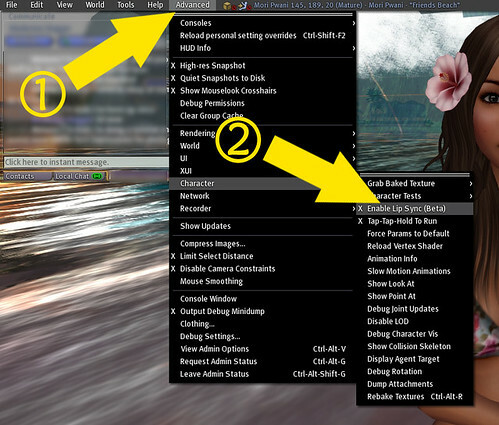 This can end up involving a lot of repeat attempts as you try to capture the right moment of the animation. Great post and a great idea. I learned a LOT! TYVM. Bookmarking!